Thanks to Miriam for the photo! Now that October is slipping merrily through our fingers -clutch though we may – I thought I would catch you up on September’s news. The Organic Feast was a success! Everyone seemed to enjoy themselves and the food was well received. We started out with a roasted garlic soup as a tribute to the phenomenal garlic harvest they took in at the farm. The garlic heads were roasted whole with olive oil for several hours until they were very soft and sweet tasting with none of the usual garlic pungency. Then the cloves were popped out of their papery skins and cooked with parsnips and apple cider for more sweetness. It turned out smooth and silky in texture with a wonderful warm brown colour. Second course was a salad of baby lettuces, spinach, edible flowers and pea shoots – all laboriously hand-picked by our farmers. 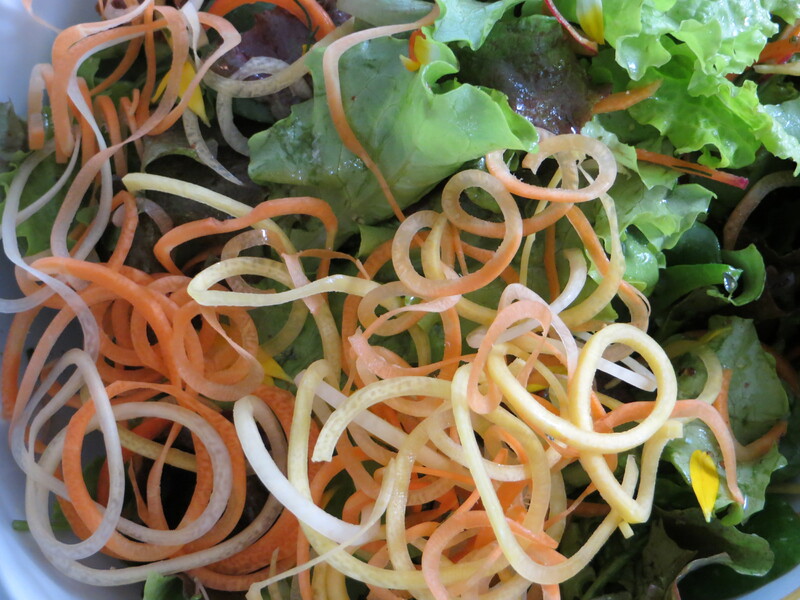 We dressed it in our popular balsamic vinaigrette and garnished with three colours of carrots cut on our new culinary toy – a spiralizer which turns root vegetables into variously sized looooong spirals. Miriam’s beautiful picture shows them off to their best advantage. Main course was Fenwood Farm’s delicious organic chicken halves which we brined (for an extra bit of flavour and moisture) and grilled on two huge barbeques just outside the tent where people were seated. It made a good show and the smell sure encouraged appetites! The chicken was backed up with a vegetable melange and rosemary-roasted new potatoes. Dessert went a bit over the top – just for fun! 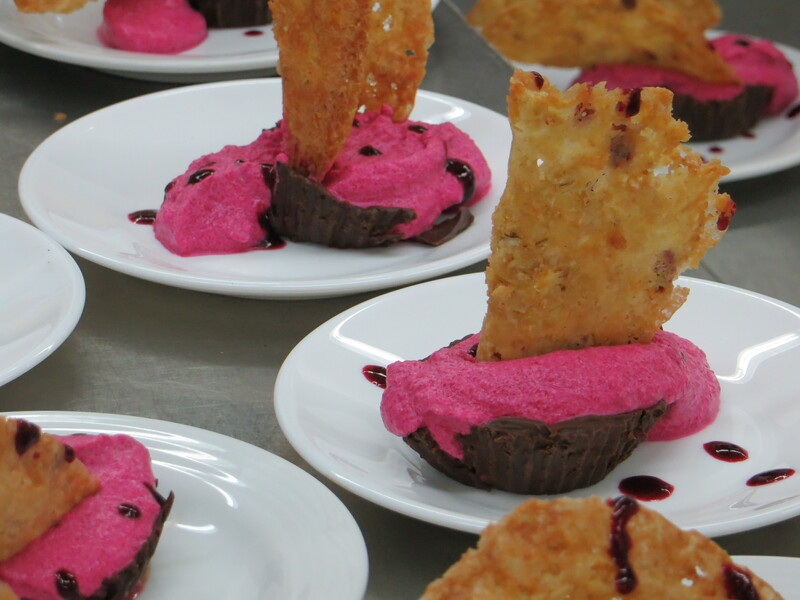 We had an organic chocolate cup filled with a beet mousse, garnished with an oatmeal tuille and then finished with a berry coulis. Pretty and pretty tasty, but rather a lot of work! Now it’s time to start researching recipes and suppliers for next year… in moments stolen from the 40 day retreat which goes on for all of October and half of November. The fun never ends in this kitchen! On a sadder note, it pains me to mention that Kate has decided that her personal destiny was not to be found in Ontario and has moved on. We will miss her madly – her gentle humour, her thoughtfulness, her extreme kitchen skillz and her photography! All the best, Kate! Here’s hoping you drop by and comment occasionally.